I want to thank Paige Conner Totaro, the founder of www.alloverthemap.net for hosting my blog this year and for providing R and me with lots of other advice and inspiration. If reading about our adventures has infected you with the travel flu, as we hope it has, you should continue to visit Paige’s site for great tips and ideas for individual and family travel. For example, Paige's latest post describes an amazing Yucatan vacation rental for families, to host a family reunion, or for a girlfriend getaway. It may be too fancy a place to host a drunk frat brother weekend. I also want to thank everyone who we met on our journey who helped us, hosted us, or just said "Hi." I don't want to start naming names for fear of leaving somebody out, but the amazing and adventurous people that we met are the main reason why this year will be unforgettable for us. Thank you. Finally, thanks to all of you who have taken the time to read my blog. I know that sometimes I can go on and on with no apparent point, but I hope it was as much fun for you to read my blather as it was for me to think it up and write it. At the outset of our trip, I attempted to interest you in what we were doing by posing three questions. Now, finally, as my last blog post of this trip, I will attempt to answer them. Q1. Is Mexico as lawless as the media portrays? A1. I don’t think so. We survived without anyone shooting at us, robbing us, or even frowning at us. On the contrary, Mexico was perhaps the most pleasant surprise of the trip and we spent five months in various places there. It is one of the most beautiful countries - stunningly tall mountains, endless and mostly deserted beaches, outrageously delicious and affordable food - and has the most friendly people. I kid you not, even the machine gun patrols that drive around looking for trouble-makers waved at us. Don’t let the media fool you. Q2. Does the Bright-rumped Attila still ply the skies above Central America? A2. We didn’t see the bird in our travels through Guatemala, El Salvador, Honduras, Nicaragua, Costa Rica, and Panama, but we did see a mass nesting of sea turtles, hundreds of monkeys, stingrays and reef sharks, scorpions, tarantulas, dolphins, sloths, jaguars (at a zoo), and toucans. 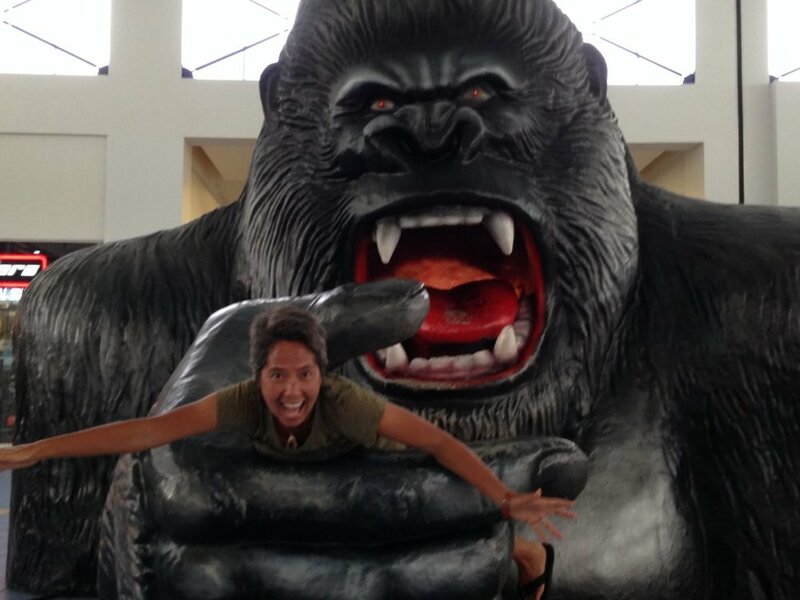 R clowning around with a big monkey at the mall in Panama City. Also, to soften the blow of missing out on the Bright-rumped Attila, we did spot its cousin the Bright-rumped Tanager one fine day while hanging out on the back porch of our workaway in Costa Rica. Q3. Can a 1985 Volkswagen camper van handle the ups and downs of the Andes Mountains? A3. Unfortunately, for reasons too depressing to get into again, we didn’t make it to South America so I am not able to answer this question based on an actual experience of driving through the Andes. However, based on our van Wesley’s performance through the numerous Sierra Madre ranges in Mexico, I have no doubt it could have conquered the Andes Mountains as well. Q4. Is this the end or is it just the beginning? A4. It’s the beginning. Even though the blog of our real-time overland adventure is at a convenient stopping point, the Vanamos family will not go away. We will be launching our own website - www.vanamos.net - very shortly. On the website you will find updated articles about our experience posted weekly, the latest about our vantastic Volkswagen Westfalia - Wesley, information about preparations and budgeting for our year long adventure that you can use to plan your own trip, maps, what we know about border crossings, family travel guides for each country we visited so you know where to go and what to do, photos of me in a bathing suit to print and hang around your house for daily inspiration, and much, much more. So stay tuned and let our end (of sorts) be your beginning. If I’ve delivered any message at all this year, let it be that there is a lot more to life than living 9 to 5.